No team has gotten more innings from its starting pitchers this season than the Cleveland Indians. No team has gotten fewer than the Tampa Bay Rays. Yet the Indians and Rays have ended up in a similar spot. Cleveland’s team ERA is 3.84. Tampa Bay’s is 3.82. The Rays have been unorthodox in their approach , eschewing a normal starting rotation in favor of a system in which one of their usual relievers might take the mound at the beginning of a game. Right now, Tampa Bay’s depth chart on MLB.com only lists three pitchers in the rotation — yet the Rays are 60-58 and have a chance for their first winning season since 2013. Tampa Bay has tried using an “opener” at the start of games. One of the team’s relievers might start the game and pitch an inning or two. Then another pitcher — who might normally have been the starter — comes in and perhaps pitches through the middle innings. If his outing begins in the third, for example, he may benefit from not having to face the top hitters as often. The result is that the Rays’ stats are significantly skewed. 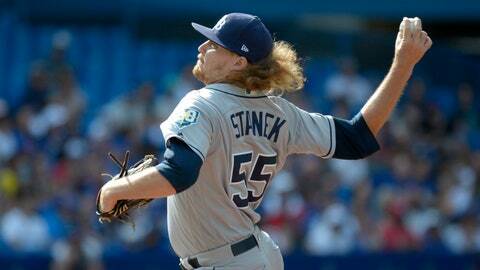 Tampa Bay’s starters have thrown only 485 1/3 innings in 118 games. Cleveland, led by its stellar foursome of Corey Kluber, Trevor Bauer, Carlos Carrasco and Mike Clevinger, has gotten 737 1/3 innings from its starters. The Indians are atop the AL Central, but the Rays are comparable in terms of run prevention. The starting pitchers for the 2012 Colorado Rockies threw only 765 innings, and according to the database at Baseball-Reference.com, that’s the lowest total since at least 1908 in any season that wasn’t shortened by a work stoppage. The Rays appear well on their way to finishing below 700. E.D. stands for Edwin Diaz, and it also stands for every day. The Seattle closer saved all four games of his team’s series sweep of the Houston Astros. The last victory came in 10 innings Sunday. Diaz now has 46 saves for the playoff-chasing Mariners, and he could threaten Francisco Rodriguez’s record of 62, set in 2008. Diaz has also posted a 1.98 ERA. Problem is, his career high in innings is 66, set last season. He’s already at 59 this year. Diaz has also made 59 appearances. Only Jose Alvarez of the Angels (60) has more. David Bote and Cesar Hernandez both circled the bases in memorable fashion. Bote, pinch-hitting for the Chicago Cubs, won Sunday night’s game over Washington with a grand slam in the bottom of the ninth. The Cubs were down 3-0 with two outs before Bote’s drive to center . Hernandez went all the way around the bases after dropping a bunt in Philadelphia’s 5-2 win over Arizona on Tuesday night. There were two throwing errors by the Diamondbacks on the play . The Phillies play the Mets next weekend in the Little League Classic at Williamsport, Pennsylvania, so Hernandez should already be in the right spirit after taking advantage of Arizona’s carelessness. Mookie Betts of the Boston Red Sox continued his push for the American League MVP award, hitting for the cycle in an 8-5 win over Toronto on Thursday night. He completed the cycle in style, with a home run in the ninth inning.